US, 1994, 95 minutes, Colour. 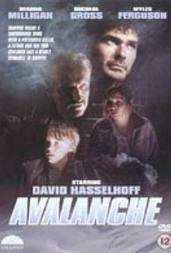 Avalanche is a standard thriller telemovie. It focuses on a jewel smuggler and a family who are taking a holiday in the Rockies. When the smuggler's plane crashes, an avalanche starts and engulfs the family as well as the smuggler. They rescue him but he then terrorises them. The special effects are very good for the avalanche, especially as it crashes into the house. 1. Entertaining telemovie? Disaster? Thriller? 2. The Rockies scenery, the mountains, the special effects for the avalanche? 3. The title, the focus, the threat? 4. Duncan and Russia, the jewels, the pilot, the flight, his killing the pilot, parachuting out, the crash of the plane and the cause of the avalanche? The irony of his being caught in the avalanche? 5. Brian and his family, travelling to the holiday house? The separated parents? Brian as a writer? The daughter reading the book, the son and his computer games? Settling in? Plans for the holiday together? Being engulfed by the avalanche? The effect, their fears? Helping one another? 6. Finding Duncan? Reviving him? His collaboration with them? The plans, ingenuity, digging the tunnels? 7. Duncan and his anxiety about getting his diamonds, his smooth talking with Deirdre, friendship with Brian, the Purple Heart and talking to Max? Trying to recover the diamonds? The irony of the family discovering them, concealing them? His growing threats, violence, their tying him up, getting free, the continued violent attacks? 8. Duncan's growing obsession with the diamonds? The family taping him but his getting free despite his wounds? 9. Max getting out, running through the snow, finding the dead pilot, the dog and the Indian? Trying to find his parents? Bringing the rescue? 10. Brian and Deirdre, getting in the car, backing it out, the roof collapsing on Duncan? The final rescue and the family being reunited?